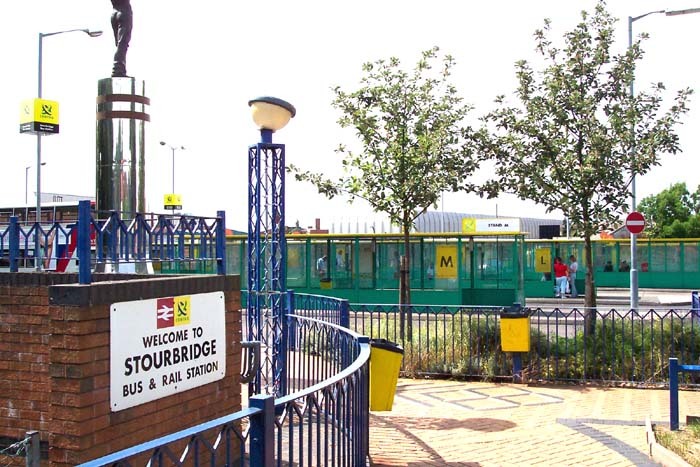 One of the more endearing stations of the region, Stourbridge Town was originally opened in 1879 and closed in 1915, reopening in 1919. 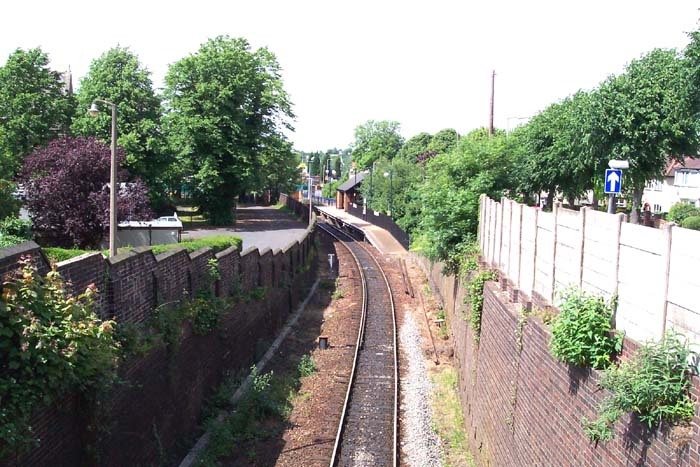 The ex-GWR station now sits on a single-line track from Stourbridge Junction which terminates at the buffer-stop seen above at the entrance to the station looking towards Stourbridge in July 2003, although this was not always the case. The station building itself is not in its original position - originally, it was sited on the opposite side of the track. 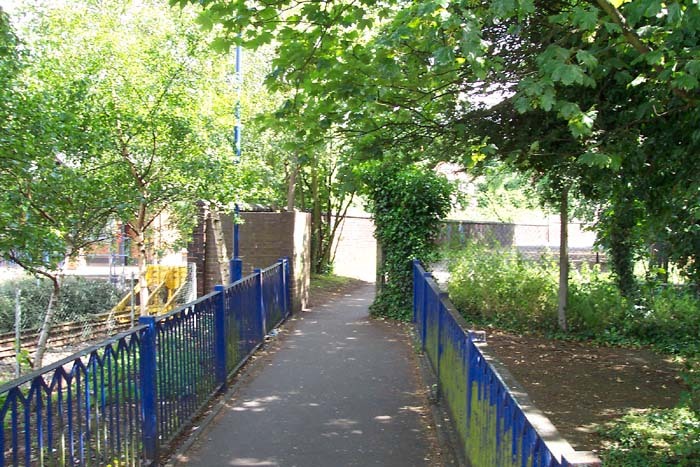 Above-left we are on Parkfield Road looking down the driveway that led to the original station building that was roughly opposite to where the current station building stands and can be seen in the distance. Above-right we have walked down the driveway and ahead is the site of the original station which was a very large affair for what was in effect a very small branch line. 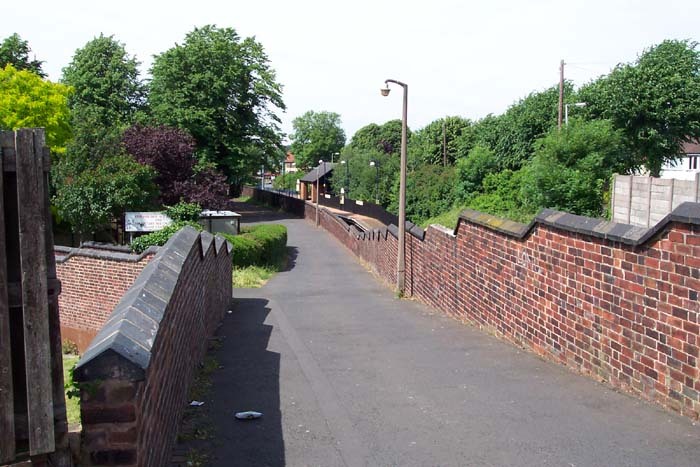 Above-left we are on the site of the old station and platform looking out to what is now the Stourbridge bus station with the current station site to our right. 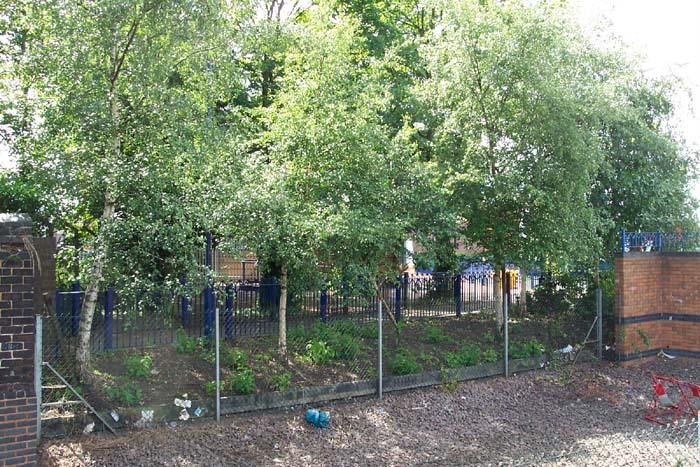 Above-right we are standing on the current platform looking across at the old platform site that is now just a walkway and drive between Parkfield Road and the bus station (to our right). 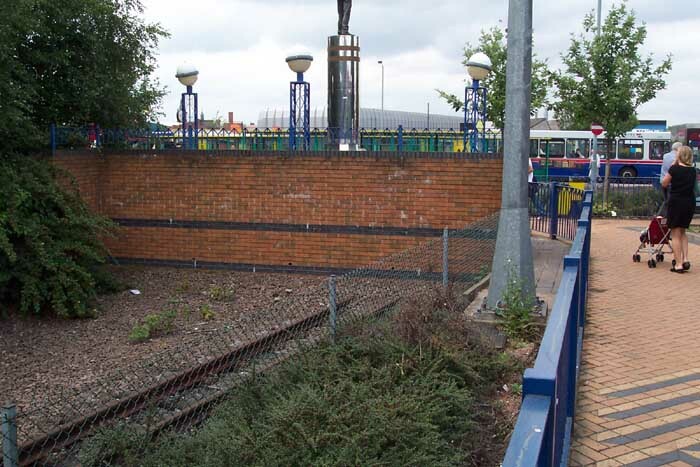 At this spot, to the left, was the base of the old station footbridge that was of an iron lattice-work design which outlived the old station that was demolished in 1978, but was rendered pointless with the proposed new design for the single-track station and was dismantled during the 1980s. 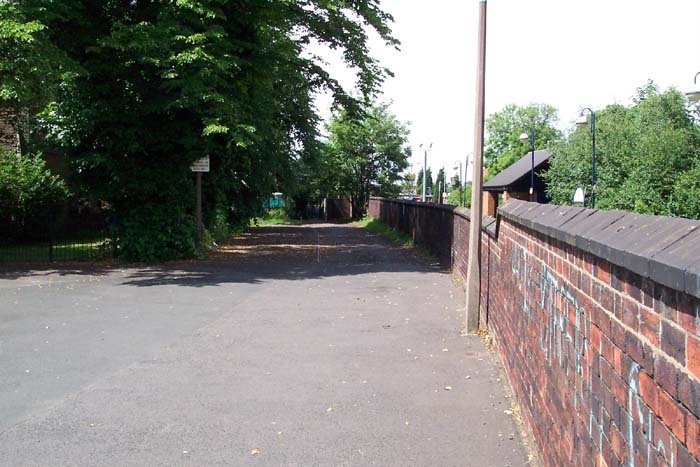 Above-left we are again standing near the site of the old station building looking back towards Stourbridge Junction as the line curves away under Parkfield Road bridge and above-right we are on Parkfield Road bridge which gives a good perspective of the station site: new and old. Above we see the view from the same spot as the photograph at the top of this page but looking in the other direction. 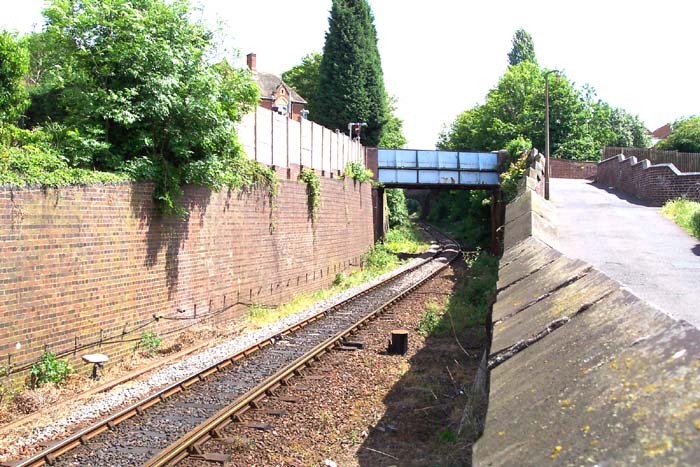 The line now just runs into ballast and a brick wall with the Stourbridge bus station now standing across what was once the trackbed. The original end of the line was a few yards ahead of this point as the expansion and redesign of the bus station encroached on some of the site once occupied by the railway. Although the passenger service has always terminated at this point, a single-track line extended from here to Town Goods that closed and was lifted in the mid-1960s. Above-right we see the bus station from the entrance to the current station: the goods line extended ahead here via a bridge over Foster Street East that was removed in 1967. 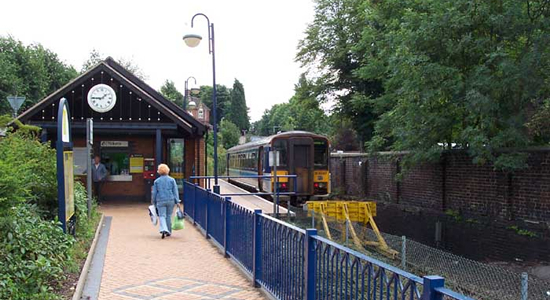 It is good that this branch is still operational and is operated by a very frequent single-car DMU shuttle service between here and Stourbridge Junction. The GWR used to operate the service with its 'railcar' - most notably W14W - and other single-car vehicles have been piloted on the line: check out the Parry People Movers Ltd web site for an interesting concept-vehicle trialed on this line.